If you have ever thought that having kids fills your house up with stuff, try going on a trip with them. Sometimes it feels like you are taking more kids items with you than you are actually leaving at the house! Packing smart has become even a bigger issue now that airlines are starting to charge more and more to check baggage. I have even seen where one airline is now charging to use overhead bin space! It is getting harder and harder as a parent to pack what your family needs for a trip. 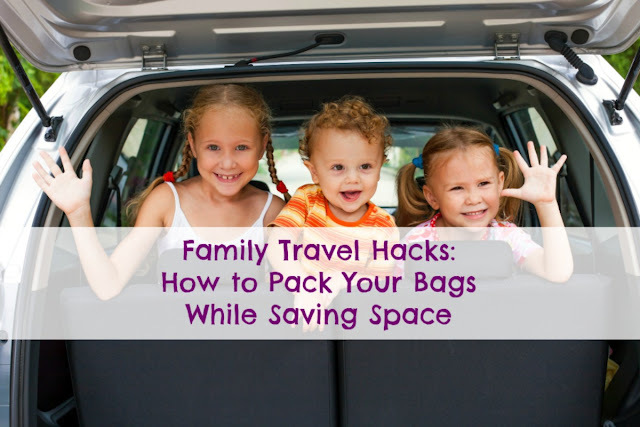 Hopefully these family travel hacks can save you time, sanity, and money! 1. Pack small toys in sealable containers with compartments. When your child insists on bringing little toys on a trip, it can be the stuff of nightmares. Many times the toy gets lost on the floor or at a rest stop. Then you know what happens when your kid sees that it is gone. Whether you traveling by plane or by car, pack items like Legos or small action figures in a sealable container with compartments. We like Easy Lunch Boxes. They keep the items organized, save space in baggage, and the lid stays on tight when carried in a backpack. 2. Have presents shipped to where you are traveling to. Many times when you are traveling you will be celebrating holidays like Christmas or birthdays. I am not suggesting packing the present up yourself, heading to the Post Office, and shipping them. I am telling you that it pays to think ahead. Order the present online and have it shipped directly to the address that you are staying at. Chances are you will be ordering the present online anyway, so save a step, and some space in your luggage by having it shipped. One time, we even bought a Pack-N-Play off of Amazon and had it shipped to the place where we were staying because it was cheaper than bringing ours with us! 3. Think of your suitcase like a filing cabinet. Tightly roll every piece of clothing possible. There is an art to it, but don't worry, you will get practice as you roll every family member's clothes. Just as important is neatly stacking the rolled clothing in your suitcase. Think of it like filing cabinet with each file organized in a row. Not only will this save space, but you can pack clothing in a certain order to make outfits easier to find. 4. Leave your shoes at home. I know, I know, you love your shoes. Do you love giving more money to the airlines as well? Limit yourself to one pair of casual shoes and one pair of formal shoes for each member of your family. If it is hot weather, you can bring a pair of sandals for each as well. Shoes are oddly shaped, heavy, and are inefficient when it comes to taking up space in your bag. Even with three family members with you, there will be lots of shoes to pack. Take advantage of the space inside the shoes by stuffing socks and other small items in there. All of those little things end up eating space in your luggage. Don't leave all of this valuable space inside of your shoes unfilled. 6. Do laundry on the road. It's simple math. The more family members you have, the more your luggage multiplies exponentially. However, if you do laundry on the road, your family will need much less space in suitcases for clothing. You don't necessarily need to find an offsite laundromat either. Sometimes hotels, such as Homewood Suites, will have their own laundry rooms on site. Another plus is that you will have less dirty laundry to wash when you get home! 7. Use vacuum seal bags for jackets. Puffy coats take up a tremendous amount of room. If your family doesn't want to wear them on the road, then pack the jackets in vacuum seal bags. They make jackets incredibly small and flat. This makes it easy and efficient to pack jackets in your bags. As it turns out, packing your family for a trip doesn't have to be a headache. Use my family travel hacks above to make your next vacation, family reunion, or road trip a better experience. Remember to head to mencanplantravel.com where you can find great travel advice from a number of experts. You can also search social media for #DadTime and #TravelMANager for even more family travel tips!